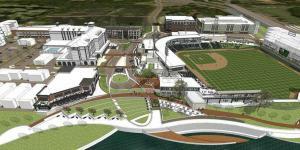 The company hoping to build North Augusta’s proposed riverfront stadium has acquired more than 29 acres on which to erect the $183 million mixed-use project. Atlanta-based Green­stone Properties Inc. said the property just east of the Hammond’s Ferry residential neighborhood will be the future site of Ballpark Village, a commercial district featuring the city-owned Augusta GreenJackets stadium as the centerpiece. Though the entire 35-acre development, collectively known as Project Jackson, hinges on North Augusta City Council’s approval of the “master development agreement,” Greenstone said it moved forward on the property acquisition as a sign of good faith. Aiken County real estate records show Greenstone acquired the land April 1 from North Augusta Riverfront Co., the local partner of Hammond’s Ferry developer LeylandAlliance LLC, of New York, for $4.3 million. Lexington, S.C.-based First Community Bank provided financing for the purchase, which is considered the largest capital outlay since Project Jackson was announced in 2012. Greenstone Properties already is familiar with North Augusta, having constructed the $10 million Medac Inc. office complex just north of the Hammond’s Ferry area in 2015. It also developed Parkview Field in Fort Wayne, Ind., a stadium that houses that city’s minor league baseball team, the TinCaps. That project also was a public-private partnership deal. As the master developer, Greenstone Properties will oversee construction throughout the commercial district and will be responsible for the $58 million city-owned ballpark and an adjacent 900-space parking deck. Other components of the district will be a 200-room hotel, 50,000 square feet of retail, 60,000 square feet of offices and 275 apartment units. City officials have said they expect ballpark construction to be complete by late 2017 or early 2018. The city is paying for the stadium through bonds and a special Tax Incre­ment Financing District that allows the city to collect tax revenue on the incremental difference between the district’s rising property values and values for Aiken County, which would remain frozen at 1996 levels for 30 years. Prospective hotel and restaurant tenants have reportedly been identified but are not expected to make public announcements until after the master development agreement is approved. Though the agreement’s approval is not contingent on Greenstone Properties’ ownership of the land, certain aspects of the contract – such as the donation of stadium property to the city – can be carried out legally by the property owner only. North Augusta City Administrator Todd Glover said the council’s second reading of the master development agreement could come later this month or early May.